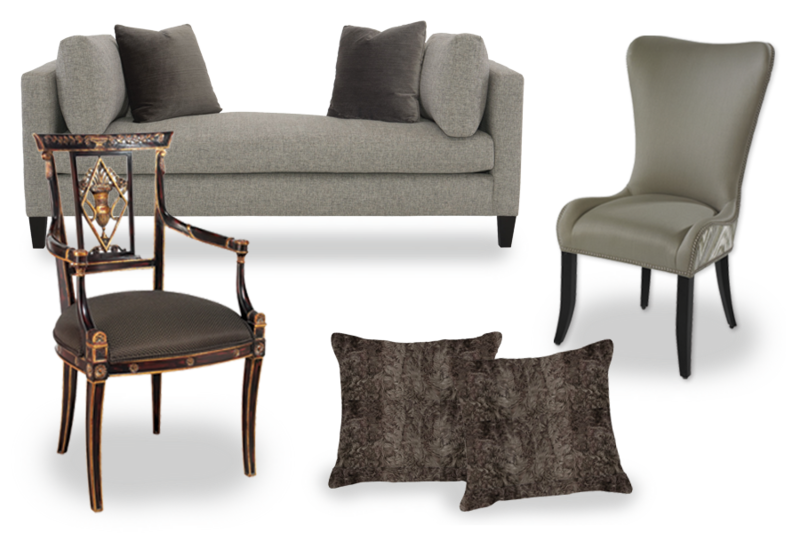 Designer Showcase Features Elegant Study by Design Consultants Gail Whiting. We are proud to announce that Design Consultants and Gail Whiting have been selected to take part in this year’s Mansion in May at Alnwick Hall – The Abbey, in Morris Township. 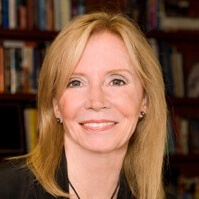 Hosted by the Women’s Association for Morristown Medical Center, the event brings in a great amount of funding totaling more than $10 Million Dollars since its inception in 1974. With more than 1,300 volunteers and 33,000 visitors at the last event in 2014, The Mansion in May is one of the most important designer showcases in the country. In 2017, the proceeds from The Mansion in May event will be donated to the building of the Center for Nursing Innovation and Research. This project will be devoted to teaching as well as advancing the technology in the field of medicine to provide more efficient and capable practices for healing. 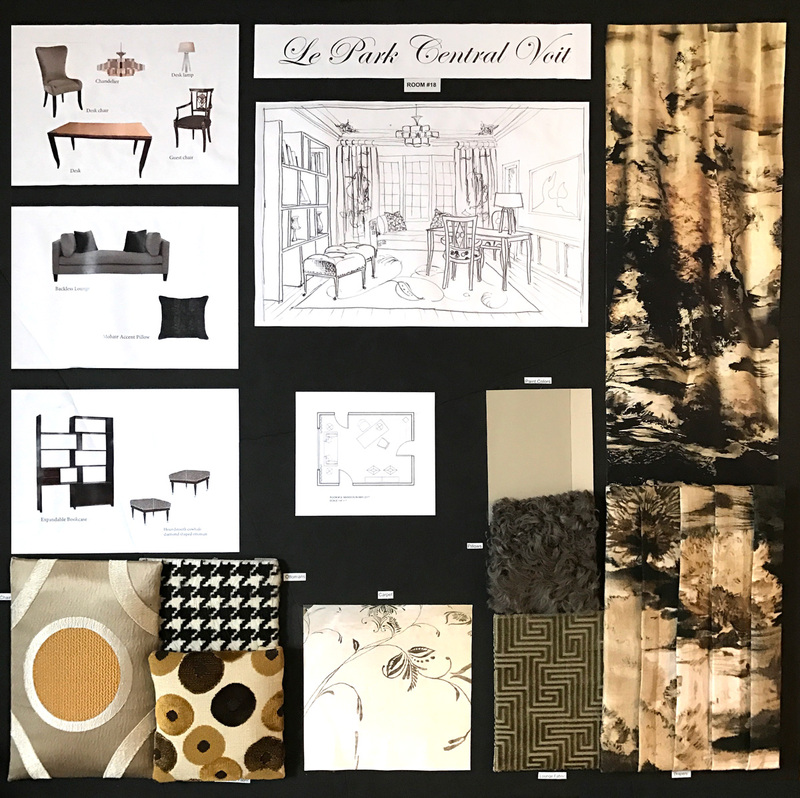 Every other year, professional interior designers are invited to visit the mansion, select a room, and propose a presentation board that shows their vision. Gail chose an intimate study space because the possibilities “spoke to her,” with its central location and interesting light. She also was attracted to the ornate plasterwork on the ceiling and beautiful moldings. She submitted her design board (pictured below) and was thrilled to find out that her design had been accepted. The vision for this room is a classic home office that speaks of today’s wireless technology and paperless values – very soft, sophisticated, modern and of the moment. Against the beautifully lit back window, the drapery is a vision of Central Park in soft sepia colors while a comfortable backless lounge, presented in a mossy green geometric velvet, features a lambs wool kidney pillow in dark mocha. In the center of the room, a handsome goatskin table desk with its mahogany legs and 14k gold detailing complemented by a desk chair upholstered in an elegant taupe satin fabric with gold and beige embroidery. A black, hand–carved guest chair overlayed in an unexpected contemporary polka dot cut-velvet fabric completes the work area. 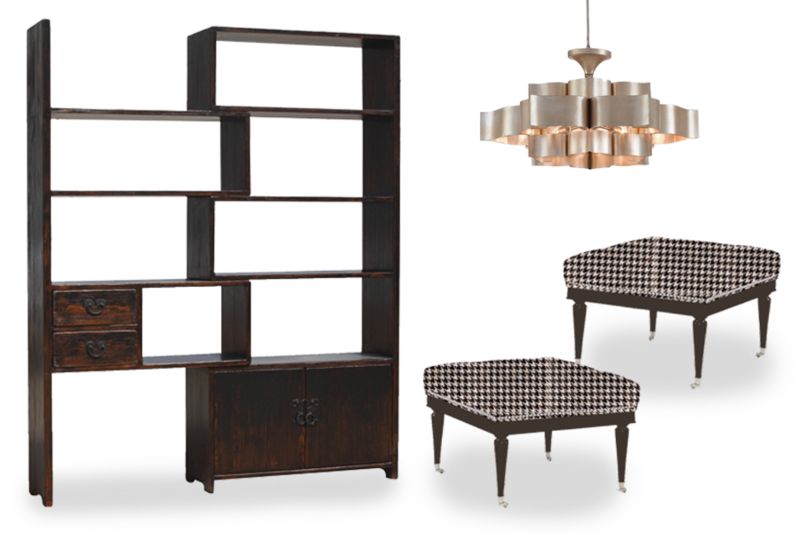 Diamond benches adorned in black and white houndstooth leather sit opposite the desk and provide convenient, cozy seating. Gail elected to use fun fabrics for the furnishings to provide a sense of balance with the taupe–gray abstract Nepal rug alongside similarly color washed walls. A versatile Asian-inspired expandable bookcase provides ample storage, complemented with attractive collectible accessories. Completing the space is a bronze bust atop a sturdy walnut pedestal and an oversized Asian painting. Truly a beautiful place to focus and relax. 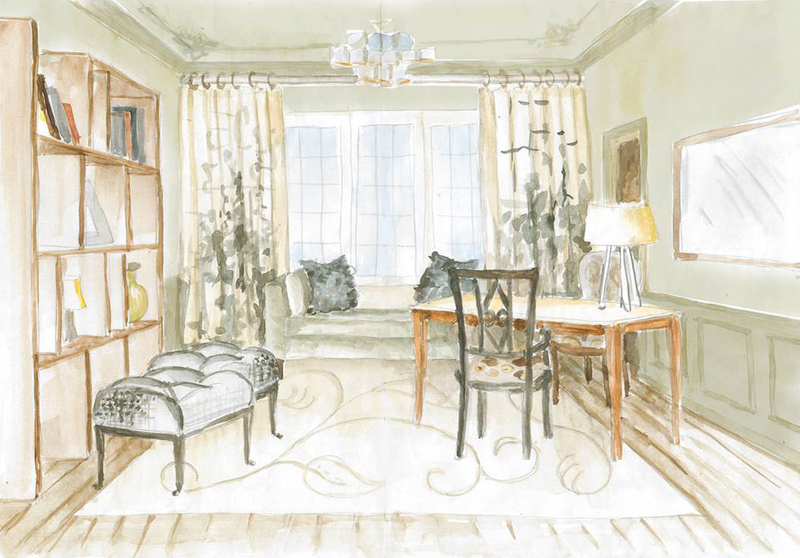 Gail’s tranquil vision for the study is reflected perfectly in her flowing design scheme, with each ingredient of her design process representing itself in the final product. She masterfully ties together all aspects of an upscale home office with modern amenities, eye-catching furniture pieces, luxurious fabrics, effortless style, and serene color palette.